Based on the hugely popular novels by Kerry Greenwood, ABC's 'Miss Fishers Murder Mysteries' has completed post production with it's first episode getting rave reviews and impressive ratings of over a million viewers! Set in 1920's Melbourne, this charming series is both a return to form for ABC and a fresh creative direction in a sea of contemporary crime drama. With an huge and incredible cast, gorgeous production design and each episode featuring unique settings and locations, Every Cloud and ABC have created something special that stirs memories of great Australian and British television of years gone by. Our involvement in the series has seen an already visually rich world transformed by vistas and elements that would have been impossible to achieve within the limits of budget, logistics and schedule. Our unique ability to digitally remove, add or augment elements to live action footage quickly and cost-effectively was a perfect fit for a production with such broad scope as 'Miss Fisher'. Every Cloud Productions embraced digital effects early in the process, and it quickly became an indispensable tool for expanding production design, usability of locations and many other aspects of the shoot to create a rich and believable world. We worked closely with the producers and block directors to ensuring each episode had it's own style and attention to detail. Essentially anything that couldn't be dressed out, framed out or cut around was left up to us to deal with - and with so many bustling locations over thirteen Eps, this ended up being quite a task. The team at Chroma produced over 600 shots across 13 episodes, from digital removals and augmentation to CG vehicles, stunt sequences, digimatte environments, dynamic simulation and more that are peppered throughout the series. The previous limitations of shooting period-genre became exciting opportunities to create a layered, cohesive and believable world for the audience to enjoy. Like the books, each episode is set against a unique environment and it's what has made the show so much fun to work on. Every script revealed new challenges and set pieces, and diverse techniques were required to achieve them within the tight schedule. Ocean liners, circuses, turkish baths, theatres, steam engines and so much more all require a design balance between practical and digital methods to create incredible production value on a broadcast budget and schedule. Check out the latest episode here along with some clips detailing some of the effects process. Miss Fisher's Murder Mysteries is airing on ABC for the rest of the year, don't miss it! Directed by David Pullbrook and featuring Julia Blake and Firass Dirani, Last Dance is a sombre story of cultures and generations. The film was recently made an Official Selection at the 2012 Melbourne International Film Festival. We provided a wide range of VFX for the feature including some complex removals and fixes, bullet hits, blood effects and CG aircraft. Chroma Media continues to evolve it's services to meet the integrated needs of Australian production, with the addition of in-house sound designer, Bret King to the team. 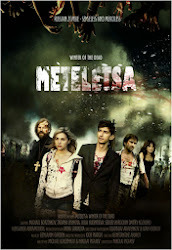 Bret has already provided sound design and mixing for several features, shorts and TVC's at Chroma and has just begun work on Russian zombie film, METELESTA. Bret's expertise and experience brings even more value to Chroma, as he oversees our brand new, integrated mixing studio. This boutique facility is ideal for short form and independent productions looking for something a little different in addition to TVC and radio production, featuring 5.1 mixing, ADR/VO facilities, foley, sound design and big screen, uncompressed HD playback. The rooms tight integration with our visual systems are especially beneficial to broadcast design, titles and TVC clients already working with Chroma.